Washington’s Mason Mustain competes in the dual match at Wilmington Wednesday, Dec. 5, 2018. WILMINGTON — A young Wilmington wrestling squad made its season-debut Wednesday night against an old league foe. In a back-and-forth dual with former South Central Ohio League rival Washington, the Blue Lions surged ahead at the end for a 38-30 victory. Wilmington head coach Kelly Tolliver said Wednesday’s match is part of the learning process for the young Hurricane squad. “I was happy with the effort from our young team,” Washington head coach Louis Reid said. “This was our first dual of the year and we came out with a victory so it was great for the team. After giving up six points thanks to a forfeit at 106, Wilmington eventually took the lead 18-17 thanks to back-to-back pins by Dominic Davidson and Sam Eastes at 138 and 145, respectively. Washington, which opened the season last weekend in Franklin, regained the lead thanks to wins by Will Baughn and Kalub Wilkerson. Baughn’s was in the closest bout of the night, as he edged Wilmington’s Trent Holiday 9-8 at 152 pounds. Wilmington retook the lead 30-26 thanks to two straight pins by Kile Holland and Canon Ford, but the Blue Lions won the final three bouts to take the dual. The first two hours of the night were an opportunity for Washington Court House and Wilmington youth and middle school wrestlers to take the mat and show off their skills. Many youth competitions involve multi-mat setups which rarely allow athletes to have the spotlight to themselves. With just one mat setup, all wrestlers had center stage. “This is the third year we’ve done it together,” Tolliver said. “We’re trying, on purpose, to give those kids the spotlight. In a regular kids tournament, there are eight or nine of them wrestling at once. Here they have the mat all to themselves with the crowd watching them. The Blue Lions will host Jackson and Circleville Thursday. 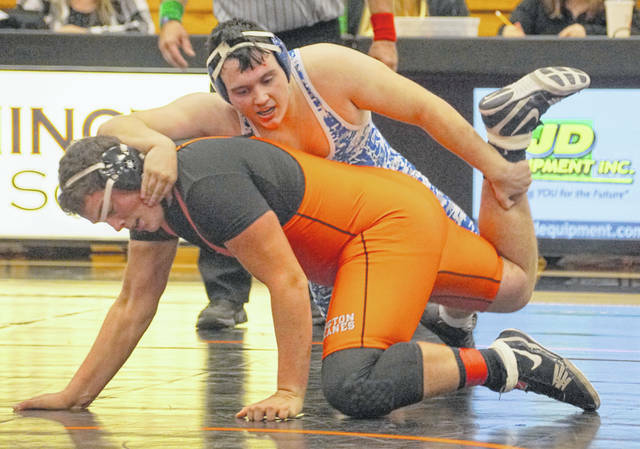 Mat time is 6 p.m.
Record-Herald sports editor Chris Hoppes contributed to this report.